Vidshadow partners with Next New Networks. This will allow Vidshadow to syndicate Next New Networks’ market-leading programming across the Vidshadow network, which includes both affiliate sites and company owned online destinations such as www.Vidshadow.tv. Next New Networks currently operates twelve successful networks within the automotive, entertainment, pop culture, fashion and politics categories, including hit networks such as: Channel Frederator, Barely Political, Fast Lane Daily, Garage 419 and VOD Cars. Oki has developed “Audience Rating Information System” for IPTV, which will be offered to the Japanese market. The system collects viewership data to enable broadcasting companies to improve their services. IPTV service is expected to grow as telecom carriers in Japan will increase their IPTV service provisioning with the start of next-generation network services, and the ITU working on setting international standards. Current ground-based broadcasting systems have functions to collect viewership data such as user preference and viewer history, as it is important for broadcasting companies to collect such information. However, with current IPTV services, there are no equivalent user information collection functions. RealPage's IPTV service, StarFire, is having an IPTV equipment garage sale to offload some headend, encoding, satellite, and set-top box gear. Below is the entire list of model numbers and quantity. If you're interested in any of the equipment, please call Patti Pinkerton at 1-972-820-3900 to negotiate prices. Serious inquires only. JumpTV and NeuLion announce the execution of the definitive agreement in respect of their previously announced merger. The terms of the definitive agreement are outlined in detail in the June 9, 2008 announcement. Closing of the proposed merger is scheduled to occur on or about October 1, 2008 and is subject to regulatory approvals (including approval of the Toronto Stock Exchange), JumpTV shareholder approval and NeuLion shareholder approval. MTVN Entertainment Group announces the launch of Atom.com, a digital comedy network that distributes original programming across the Internet, handheld devices, gaming platforms, mobile phones, television and other gadgets still to be invented. Atom.com offers a cornucopia of professionally produced comedy and provides indie and UGC creators with a clear path to "go pro" themselves -- earning infamy, money and a direct path to exposure and future development opportunities on the Web, television and beyond. With the launch, Atom.com becomes COMEDY CENTRAL's exclusive partner and anchor brand for original digital comedy content, developing new properties for multiplatform distribution, building an online community of creators and viewers, and producing a half-hour TV series, "Atom TV," that debuted on COMEDY CENTRAL this week. Netvue showcased live HD TV over IPTV at its recent IPTV Technology event held in central London, UK. The live HD channel from satellite was captured by Exterity’s DVB-S TV gateway and distributed as IPTV on a local area network, before being received and decoded by Exterity HD receivers on the network. Netvue also showed full HD H.264 video IPTV encoding, from Exterity’s first production HD IPTV encoder. Netvue also showed live SD IPTV distribution, wireless IPTV units and Digital Signage at the one day event. The company’s IPTV systems offer busineses all the benefits of live broadcast TV on their IT computer network, including TV on computer desktops, Video on Demand and Digital Signage. AT&T announces the launch of AT&T U-verse TV and AT&T U-verse High Speed Internet in the Northeast Wisconsin area. AT&T is now taking orders for the service and will begin installing services for new customers on June 30. Customers can currently order AT&T U-verse services in parts of more than a dozen local communities, including Appleton, Fond du Lac, Green Bay and Oshkosh. AT&T will make U-verse services available to more homes throughout the area on an ongoing basis. The service is also available in parts of the Milwaukee and Racine metro areas. 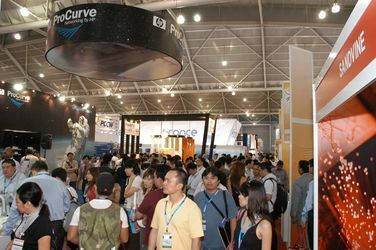 This week, 67,573 people came to Asia’s largest infocomm and media trade exhibitions - CommunicAsia and BroadcastAsia - to showcase and view the latest technologies, participate in industry forums and interact with fellow professionals from across the world. Of the total number of attendees, 52 percent came from outside of Singapore, hailing from around 100 countries and regions across Asia-Pacific, Europe, US and the Middle-East. Over four days, visitors witnessed cutting-edge technologies and business solutions designed to enhance enterprises’ mobility and users’ lifestyles. Held together with CGOverdrive2008 and inter-government and industry meetings such as the imbX Ministerial Forum and the Regional Seminar on Digital Terrestrial Television Broadcasting, the event spread over eight halls, totaling 72,000 square metres of floor space. More than 2,300 exhibiting companies from 61 countries and regions demonstrated products and solutions throughout the value chain of convergent technologies. Research and Markets has announced the addition of the "Pay-TV and Video-on-Demand Potential in India" report to their offering. The cable industry has dominated the pay-TV market since the early nineties but is now facing competition from DTH and IPTV. DTH seems to be growing strong in India and is likely to capture 24.6% of the total pay-TV subscriber base by 2012, while 11.1% of subscribers will be covered by cable-CAS. Overall growth of cable subscribers, including cable-CAS and cable-non CAS, during the forecasted period is slated to be a mere 0.51% CAGR. The growth of IPTV is likely to remain slow during the forecasted period, owing to lower broadband penetration in the country. According to the latest report from media analysts Screen Digest, HD technology has reached a tipping point in Europe, with take-up across the region accelerating rapidly. Despite the growing penetration of HD screens, the report identifies a significant ‘content gap’ caused by a lack of HD content on free-to-air platforms across the region. By the end of 2007, 18 per cent of the 165 million European TV households were equipped with HD displays - but less than one per cent of these (approximately one million) were fully ‘HD enabled’ (i.e. equipped with an HD set-top box and an HD subscription enabling them to watch HD broadcasts). Infonetics Research reports that the combined IPTV and switched digital video equipment market increased 12% sequentially to $1.3 billion worldwide in 1Q08. Infonetics' report, IPTV and Switched Digital Video Equipment, Services, and Subscribers, indicates revenue growth is being driven by growing numbers of service providers rolling out new IPTV networks or expanding existing networks to support more subscribers. The market is also getting a push from cable MSOs introducing switched video capabilities into their digital TV networks to free up bandwidth and offer more HD content to their subscribers. Contentinople is launching Contentonomics, a two-day event focused on online media business models and technology to be held at the Luxe Hotel in Los Angeles on Oct. 6 and 7. The conference will be the industry’s first in-depth look at the business models of online content development, including the use of technology to drive down distribution costs and the implementation of new advertising tools to monetize online content and applications. The event will include a “Content Showcase,” in which leading online entertainment companies demonstrate new online content and applications, as well as the presentation of original research on online content distribution. Contentonomics will be moderated by R. Scott Raynovich, the publisher of Contentinople; Adi Kishore, Senior Analyst, Heavy Reading; and Mark Kapczynski, CEO of Kontrol Media. It will bring together dozens of senior executives in entertainment, digital media technology development, content delivery services, and advertising. Symmetricom announces the Q-1200 digital/IP video headend analyzer, a scalable, multichannel video headend monitoring device, which is scheduled to be generally available in September. The Q-1200 identifies video impairments to ensure a high quality delivery of advanced digital video for telco and cable operators, enabling reduced operating costs and customer churn. Performing comprehensive audio/video analysis on 400 video streams simultaneously and content analysis for up to 100 channels, the Q-1200 accurately identifies video impairments from basic service issues to sophisticated video artifacts, such as channel audio and/or video dropout, black/blue screen, major blockiness, and more. The Q-1200 also measures video / audio with a user configurable sampling period for I frame / audio data for each channel. Concurrent announces the latest advancement in time-shifted television. The Real Time Pitcher 2000, using resilient real-time content distribution, now ensures no loss of video captures due to network or component failures, enabling content ingest success rates up to 99.999%. USTelematics announces that the Company’s Voyager in-car Mobile IPTV will be integrated with Microsoft’s MSN Autos Gas Price Finder, enabling drivers of cars equipped with Voyager to find the best, closest fuel prices in real time. Adding a GPS upgrade module to Voyager, at an additional cost to consumers, will automatically activate the Gas Price Finder feature. Voyager users will be able to click an on-screen button to automatically feed their location to Microsoft’s MSN Autos online gas price facility. The gas pricing list will display in a popup window on Voyager’s screen, even during live TV play, and then the window will automatically minimize itself after a few minutes.